With elevated views over the Coopers Beach and Doubtless Bay sits this lovely 3 bedroom holiday home. Facing north, the sun is with you all day and then at night the sunsets entertain you as you have that BBQ. The living area in this house is as big as some entire bach's! Recently turned into a holiday home all the beds and furniture are new and modern. The up to date kitchen and open plan living area open to a large BBQ deck where you will find a new hooded BBQ as well as very comfortable outdoor dining furniture. There is also a great conservatory off the dining room and lounge should the weather not be kind - very unlikely as you are in the winterless north! There are two queen bedrooms upstairs and twin king single beds downstairs, located off the internal garage. Two single rollaway beds are available by request. A portacot and highchair are available for your use. Plenty of covered and uncovered parking for both boats and cars. There is even a fish cleaning station outside should you be lucky enough to catch your dinner and a fish smoker for your use as well. It's only a few minutes drive from the nearest launching ramp and from the deck you can watch the fish jumping. There are plenty of fishing/swimming/diving/kayaking opportunities nearby. Just a two minute walk to the pohutakawa-lined shores of Coopers Beach, which is extremely safe for swimming and is the ideal family beach. It's only a 15 minute walk to the shops and bars/cafes of Mangonui, as well as the world famous Mangonui fish and chip shop. Only 15 mins drive to Carrington resort golf course and Karikari Estate winery. On the property totally separate from the main house is a one bedroom tenanted housekeeper/gardeners home. 3Kupe is the ideal Far-North base for family holidays, fishing trips, or for a romantic getaway. Prices are inclusive of GST and all bedroom and bathroom linen. Prices shown are for two people and the charge for extra adults is $15 per person per night. Sorry, no pets or smoking allowed. High quality furnishings, all linen, towels and cleaning included. All the comforts of home - and more! Expansive views over Doubtless Bay and Karekare Peninsula. Secure parking in garage for 3 cars/boats. Off-street parking for 4-5 cars/boats. 2 French Press/plunger coffee makers supplied. Instant coffee also supplied. Indoor dining room, with table that seats 8. Outdoor dining table also seats 8. Board games available for use (Trivial Pursuit, Pictionary, Backgammon, Draughts). Packs of playing cards also available. Great location, handy to beach and stunning views. Great house for families and kids can play on the deck as they provided gates to enclose the area. Lovely property with great kitchen and main bedrooms upstairs . Downstairs bedroom off garage was bit musty and hear toilet pump so less favourable room, with 2 single beds. Property manager who lives onsite was very helpful, fix BBQ fast for us. Is around to help with anything you need. Great stay. awesome view from deck and conservatory very spacious nice location.i would recommend this place to friends and go back again. Suits for 4 people. Excellent place for 4. Omgosh the property was amazing cant fault at all. This property has a stunning view of Doubtless Bay. 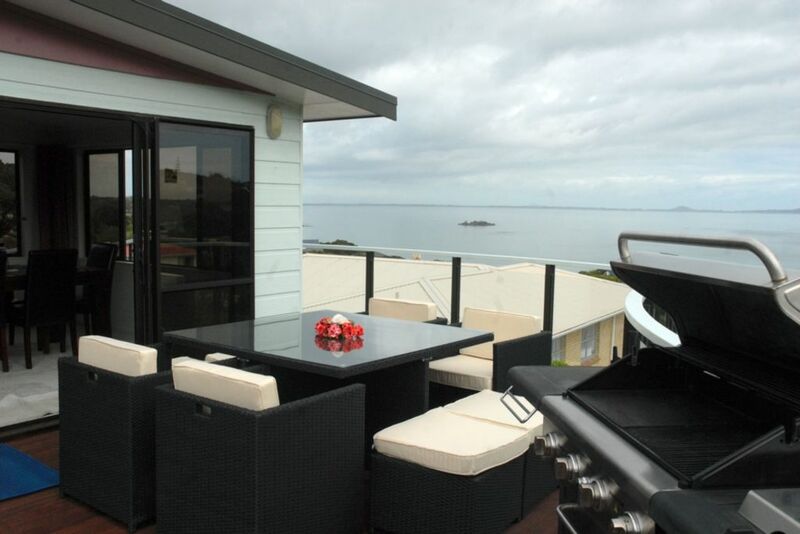 This property has a stunning view of Doubtless Bay. Good off street parking. Spacious inside with a practical layout for a large group. Beds are very comfortable and it's good to have a large bathroom. Although tea and coffee are provided, the peppermint tea does not appeal to all and the coffee and sugar were stored in jars that did not seal properly. Both had absorbed moisture and were rock solid. I also think soap should have been supplied for either the toilet or bathroom basins. Thanks for being so understanding with the issues you had while staying with us and we appreciated the feedback. We have acted on all the areas you brought up to ensure our high standards are being maintained. Excellent location, great base for family holiday or adventure. Located in the holiday paradise of Doubtless Bay in Northland, New Zealand. The region has a warm sub-tropical climate. There is over 70km of unspoiled coastline and an abundance of safe, uncrowded beaches. Coopers Beach is only 2 minutes’ walk from 3Kupe. It is a 2.5km long white sand beach which is safe for swimming and great for kids or young families. The small historic village of Mangonui is only a couple of minutes away by car. It has restaurants, cafes and gift shops, as well as the “world famous in New Zealand” Mangonui Fish Shop which makes some of the best fish & chips in the country. 3Kupe is an ideal base to explore the Far North - Cape Reinga is only a couple of hours drive away and 90 Mile Beach around 35km away. From the deck at 3Kupe you can see the fish jumping in the Bay. It’s the ideal holiday home for the keen fisherman! In season, you can catch yellow-fin tuna. Snapper and kingfish are plentiful all year round. Further off the coast you can chase marlin and other billfish. There are numerous charter operators in the area, or bring your own boat - there's plenty of secure parking.